On 21st June 2016, a correction was made to the EquityTool for Indonesia DHS 2012. The option for the toilet type question originally was given as 'flush toilet to sewer', as labelled in the published factor weight file. This was corrected in the EquityTool to 'private with septic tank' to match the original DHS questionnaire. 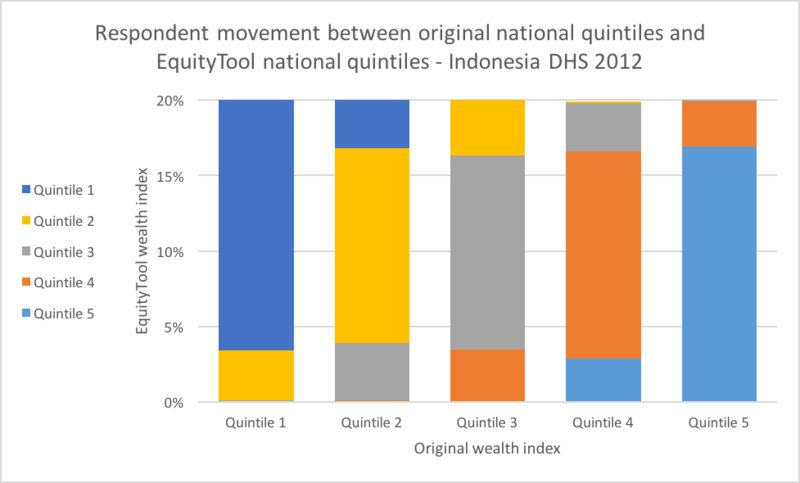 The graph below illustrates the difference between the EquityTool generated index and the full DHS wealth index. Among all of those people (20% of the population) originally identified as being in the poorest quintile, approximately 83.5% are still identified as being in the poorest quintile when we use the simplified index. However, approximately 16.5% of people are now classified as being in Quintile 2. From a practical standpoint, all of these people are relatively poor. Yet, it is worthwhile to understand that the simplified index of 10 questions produces results that are not identical to using all 33 questions in the original survey. This tool provides information on relative wealth – 'ranking' respondents within the national or urban population. The most recent available data from the WorldBank indicates that 15.9% of people in Indonesia live below $1.90/day. This information can be used to put relative wealth into context. People who live in urban areas are more likely to be wealthy. 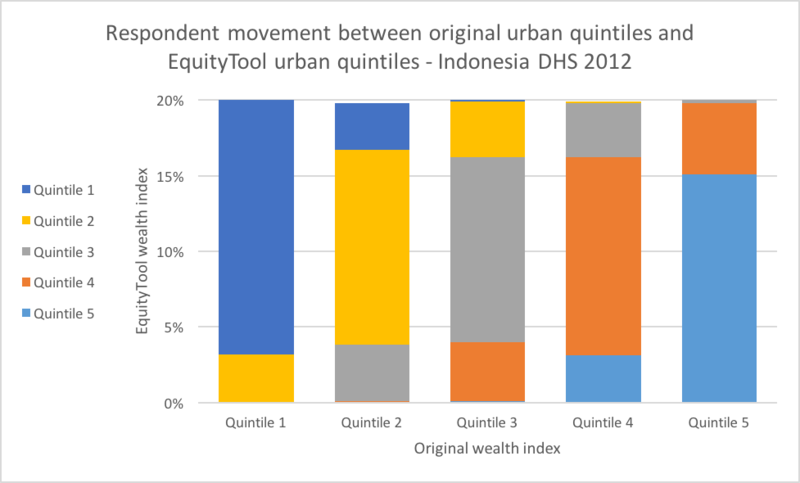 In Indonesia, 32.8% of people living in urban areas are in the richest national quintile, compared to 7.3% of those living in rural areas. Some provinces in Indonesia are wealthier than others. It is important to understand the country context when interpreting your results.